For two decades, particularly in the 60s and 70s, the name Stomu Yamash’ta was the talk of the town in the world of serious music. His approach to and passion for music, skill, sensitivity, creativity and musicality were well noted by many giants in the music world. He had worked with countless artists coming from all kind of musical genres. Great composers such as Hans Werner Henze, the late Toru Takemitsu, Heuwell Tircuit, and Sir Peter Maxwell Davis had composed pieces especially for him. Tircuit even stated that up to this day no one can perform his two compositions (Odoru Katachi and Fool’s Dance) like Stomu Yamash’ta did. In another Tircuit’s composition, Concerto for Solo Percussion, Stomu Yamash’ta awed the audience by his expressive, theatrical and virtuoso performance in which he played 47 different percussion instruments. Guitarists Leo Brouwer is also among other musical giants who had worked with Stomu Yamash’ta. In addition to Classical, Contemporary and Avant Garde music, Stomu Yamash’ta was also very much involved in jazz and rock scene but in a more experimental manner. With Klaus Schulze, Steve Winwood, Al Di Meola, and Michael Shrieve he formed the legendary group called GO, while with Morris Pert he established Come to the Edge. He also led one of a kind theatrical music group the Red Buddha Theater in which the now famous Joji Hirota was a member. 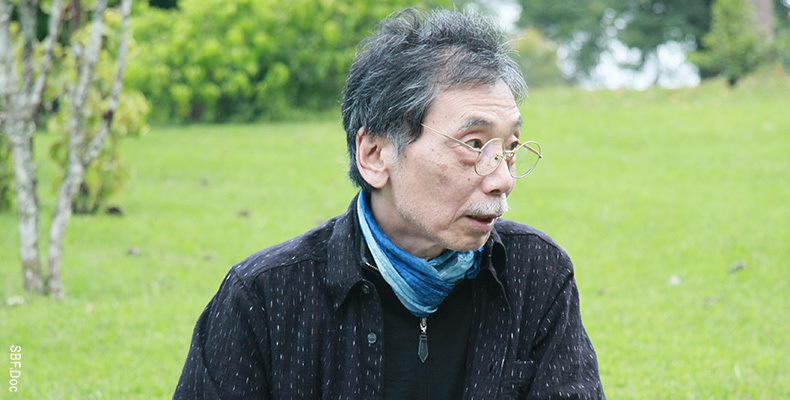 As for films, Yamash’ta had taken part in John Williams’ composition for the film Images, and composed a score for Paul Mazursky’s film the Tempest. He also arranged a compilation of his music from East Wind and Come to the Edge for the Man Who Fell to Earth. As a dance enthusiast, Stomu Yamash’ta managed to spare his time to compose ballet music for Shukumei, a production of the Royal Ballet. Born to be a musical prodigy in Kyoto on March 15, 1947, Stomu Yamash’ta was brought up in a musical surrounding since his father was a music teacher and a conductor at the Kyoto Asahi Philharmonic. Started learning piano as his first instrument at the age of 5, Yamash’ta then at the age of 9 already capable of deciding that percussion was his future instrument. At the age of 14, he already made special guest appearances for both Osaka Philharmonic and Kyoto Asahi Philharmonic. In the same year, Stomu Yamash’ta performed the film score of the Tale of Zatoichi, a film by Akira Ifukube. Still in the same year, he was hand-picked by Akira Kurosawa to perform the music illustration for one of Kurosawa’s greatest films Yojimbo. By the age of 16, Stomu Yamash’ta made his solo debut as a percussionist for the Osaka Philharmonic performing “Percussion Concerto” by Darius Milhaud. A year later, in 1964, Stomu Yamash’ta relocated to New York City to study music at the Juilliard on full scholarship. In the Big Apple, Stomu Yamash’ta was exposed to all of the 60s happenings, and of course the blossoming world of Jazz that he has embraced since then. Soon after his first semester at the Juilliard, Stomu Yamash’ta joined a music summer camp at the Interlochen Arts Academy (IAA) in Interlochen, Michigan. He felt right at home the minute he arrived there. He applied to IAA and in an instant got accepted on scholarship; from here, his extraordinary musical journey began. With all the recognitions he received and promising possibilities lied ahead of him, Stomu Yamash’ta, to anyone’s surprise, called it the night. He returned to his hometown Kyoto, Japan, and submerged to a much deeper level of musical soil, away from all the noises above. 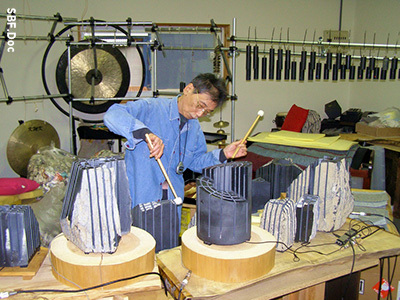 In the past thirty years he has developed percussion instruments made of stone called Sanukit, and focused his work on Zen ritual music. Listen to the World: You were on top of the world, but all of a sudden you just “stopped” and “disappeared”, what happened? Stomu Yamash’ta: Well, it happened just like that actually. I felt that I couldn’t breathe anymore. I think I had enough of all the things that I have been through, the good and the bad. I felt that on GO’s last tour in the US; when we completed the tour, I just took off to my house in London, stayed there alone for just a few days, and left for Kyoto. I didn’t just leave London; I actually left my career and the life that went with it. But don’t get me wrong, I never regret any of the things that happened to my life then, in fact I was grateful, and still am. It just isn’t the life I feel comfortable anymore. What did the people around you think of your action? Surprised and I think mostly in a more disapproving way. I completely understand their reactions. I know everyone meant well, so I appreciate their disapproval. What happened then in Kyoto? I met my parents of course, spoke to my father, and then I went to a temple to see a monk whom my family has known for years. At the time I wanted to become a priest, and I felt so certain about that. The monk said that everyone can become a priest, but only particular people can become artists because they need to have certain gifts like talent, creativity and so on. In his own way, he was actually telling me to “get out” of this thought of wanting to be a Zen monk. I tried to think over about what he said while in the meantime I still felt the need to get close to the “temple”. I felt tranquility or peacefulness within myself when in a temple. I then went to Daitokuji where my father meditated regularly; well, I grew up in and around this temple by the way. From then on, I began meditating there regularly too, together with all the young monks. It was the beginning of my “reconnection” with Zen Buddhism. Have you always had Zen Buddhism in you? Even during the time of fame and fortune when you were in Europe and US? Yes of course, even though I might not have practiced the ritual as much. Like I said, I grew up very much in and around the Daitokuji temple; it was my daily playground as a young kid. So I have been very much attached not only to the physicality of the temple, but also to the spirituality of it. My decision to quit what I had been doing then was probably a spiritual call. Let’s go back to the years when you were in the US and Europe. First you studied at the Juilliard, and then in less than a year you transferred to Interlochen Arts Academy. This was a bold move wasn’t it? Juilliard is a college level institution while Interlochen is a college preparatory level. So you practically went to a “lower” level of education. Why? Well, you have been to Interlochen yourself a few times, so you must know what kind of environment it provides. I took a summer music camp there, and as soon as I arrived I immediately felt at home. As far as the educational contents are concerned, I don’t think what they teach is any lower than any conservatories; the given materials I thought were the same as most, if not higher, at least at the time. From IAA you then moved on to Berklee College of Music in Boston. What drove you to Jazz? I was introduced to the real world of Jazz in New York City. Unlike today, Jazz was a ritual back then, at least in the US. Yeah I learned Jazz at school, but I learned it even more outside of school. Getting to know how the jazz musicians, particularly our brothers the African-American, live their lives, how they perceive things, really gave me quite an insight as well as inspiration. You lived both the Classical and Jazz worlds, how do you differentiate them? Classical music is an “employment” while Jazz is “unemployment”, at least then. Ha ha ha that’s new, and a good one too! I don’t mean it as one is better or easier than the other; they are just two worlds apart. Most Classical musicians tend to play for orchestras. If they meet the requirements then they will be hired by the orchestras; it means the musicians are actually employed by the orchestras with fixed salary and rules. In Jazz, no one employs you; you just have to find your own way to develop your music and at the same time support your life. Who do you think can be considered as giants in Classical music? Oh there are so many, and each had his or her own particular contribution to the music. However, of course there are names that more stand out than others, and also for particular reasons. Bach I think is among those names, but I would really like to mention about Tchaikovsky. I love ballet, and he had done beautiful ballet music. I think he is one of the most underrated composers while his passion and vision to me are extraordinary. What is more amazing is that he could have actually done even much more than what he already did beautifully. The problem I think had a lot to do with the readiness stage of the audience at the time. I don’t think the audience was ready for what Tchaikovsky really was, and that limited his expansion. What do you mean by the audience was not ready? Audience is one of the determinant factors in shaping and/or raising the artistry of arts and artists. In the case of Classical music in the West for instance, since the Renaissance took place the society had grown intellectually due to the blossoming social and natural sciences. Through this developing knowledge, the society gained their aesthetical horizon, and this actually made them critical towards any thoughts and creations including the arts. They were demanding in the sense that they challenged the artists to do “better” every time. Artists, in my opinion, need to have this kind of environment so that they can explore to their fullest extent, while the audience in return receive the very bests of the artists. In this matter, I think such a demand from the audience in general keeps shrinking over the time. Are you saying that today’s audience is not demanding? Oh yes they are, but certainly not in the same area or issue. How about giants in Jazz? Oh again there are so many great artists; Lionel Hampton, Miles Davis (I like Miles, he got style), just to name a few, and Coltrane of course. What’s so special about Coltrane? From the spiritual point of view, particularly in relation with meditation, Coltrane was able to reach the same destination from the opposite end. Meditation in common knowledge is much associated with tranquility, nature, peacefulness and so on, but Coltrane did not depart from these points, and yet he arrived at the same place. Honestly, I feel “lucky” when I listen to his music because I imagine all the pain that he had lived and how much “worse” than what I have been through. Let’s talk about Heuwell Tircuit’s composition. The words have it that you are still the best interpreter of his works. So what was the story? Am I? Hmm, I don’t know about that. At the time, I heard that so many people had attempted to play his work, but to him none met his expectation. So he wrote the piece but never actually heard the right outcome. One day, I felt so certain that I played it well. I actually called him and explained what I felt. He agreed to see me play, so we arranged a meeting. He was living in San Francisco at the time I think. My best guess on why he agreed to see me was because he had been hoping for quite a while that someone could eventually interpret his work. Did your presentation meet his and your expectation? Fortunately yes, and we were both very happy for that. You first studied Classical music in Kyoto, Japan, and then continued your education in the US, and made a great career in Europe. Up to the present, Europe is still considered as the home or Centrum of Classical music. In Classical music scene, it’s not easy to be recognized in Europe, even for the Americans whose culture derived from there. In your case, you made it in both continents, and yet you are neither American nor European. How did that happen? I have no idea, but since you mentioned it maybe because I am neither. Thinking about it, my orientation has always been my home and that is the East. A piece I did for the Red Buddha Theater was entitled the Man from the East. I also formed a group called East Wind. You see, I always looked to the east. Did you ever plan any of the success that you achieved? Never did. I just did what I loved to do without thinking about whether people would like it or not. I never thought about building a career, being famous or getting rich. But what you did really stirred the musical world, and in particular it brought the role of percussion to a different level. 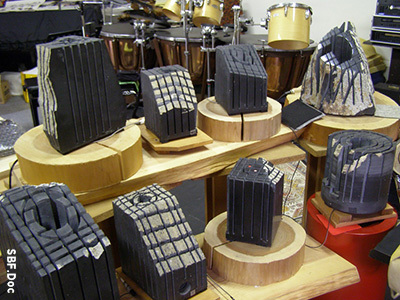 It gave the people a much wider perception on the role percussion in music, and how they can be played. Time magazine even noted you as “the Man who changed the percussion image”. So what you did was daring and monumental. Maybe, but I didn’t plan any of it. In fact, what I did during that period, in many ways was plain stupid. I didn’t think about my future at all, and it could have gone the other way, you know. Well, if you think that was stupid, then stupid is a good thing! Let’s stay stupid, what do you say? Ha ha ha… if you say so. Who would you like to thank in your life? Well, everyone who has been in my life of course; I’m really grateful to everyone who has given me anything from advise, critique, ideas, friendship, everything. In music, however, I must first thank all the musicians who were unknown, never had even the slightest taste of fame and fortune, and still committed to music until they died; they had proven what they were made of. These honorable musicians are actually the core individuals who keep music alive so that people can continue to enjoy it. What a wise statement Stomu, and I hope these words would encourage musicians who are struggling within the ideals. How do you think a musician can reach a level of mastery? Well, there are different levels, stages or area of mastery. In my opinion, the first area is mastering the techniques, regardless of what music you are into. It would be best if you could master the techniques as early as possible. In Classical music anyone should be “finish” with the techniques by the age of 18 if they want to be a world class musician. Once you are done with it, then the next stage is to explore your self-expressions and find your musical signature. From there, you then explore the “expressions” of the instrument(s) you play. At this point, expressing yourself, who you are or what you think is less important than what the instrument(s) have to say. Your signature would appear on how you understand the instrument(s). The last area is to explore the expressions of nature, meaning that we catch, translate and respond to what the nature is saying. Nature in this case is connected to the spiritual belief within us. The expression of your music is the expression of nature with your self-expression melted in it because you are a part of nature. Not everyone wants to go through all of these stages, and not everyone can, even if they wanted to. This is not something that you can force yourself into. Some stop at mastering the techniques, some walk further, and others go all the way. Like I said, musicians can reach mastery in one of these areas. I don’t mean these areas as levels in a hierarchy; it’s just that when your music is about the expressions of instrument(s) or nature, your music then has a greater chance to be timeless. Speaking of nature, how did you get involved in developing the stone instruments Sanukit? Not long after I returned to Kyoto, I met the late Mr. Maeda (Hitoshi Maeda, Ed. ), God Bless his soul, who was so keen in developing a totally new instrument. He found this peculiar volcanic rock in the mountainous region of Sanukit in Shikoku Island. He was wandering if the stones can be transformed into musical instruments. I was just amazed the first time I was introduced to the stones. When I stroke the stone for the first time, to know what it sounds like, I didn’t hear a sound; I heard it called for me instead. So it was spiritual right from the beginning. So these stone instruments were actually named after the territory where it was found? Stomu Yamash’ta rehearsing at his studio. Some of the stone instruments, Sanukit. You are quite familiar with variety of percussion instruments; how these stones differ from percussion instruments that you know? Well, first of all, these stones have been in this world for millions of years. They contain unbelievable amount of “information” since they have “witnessed” as well as experienced how the earth has evolved in such a long span of time. Compare to the stones, my existence and knowledge are just dust particles. Secondly, these stones are living beings to me. They react to how I play them; they tell me if I don’t do right. I remember how I got really ill in the early period of my encounter with these stones. Medically speaking, there was nothing wrong with me; doctors couldn’t find anything, but I felt so ill. I was in such condition for one and a half years, and during this period I didn’t touch any instrument at all. I felt like dying really, and just when I felt I was at rock bottom, all of a sudden, and out of nowhere, I had this urge to hear the sound of stone just one more time. So there I was, playing the Sanukit and thinking it as for one last time. Amazingly, instead of getting sicker I began to feel better, and my consciousness elevated. From that moment on, I began to feel how the “relationship” between me and them built up. I began to understand how I should interact with them. Believe it or not, my health recovered as my understanding about the Sanukit got better. Yes it is. On many occasions they summoned me to play in the parts that originally I was not supposed to or the reverse. Well, you know when we did festivals here like the Millennium Event, Sacred Rhythm and On Zen; we often had collaborations in which the music had been rehearsed in more or less fixed “form”, and yet at the live performance I filled in the part that I was not supposed to or the other way around. Those were actually driven by the stones. How much have you developed these stones, and what other possibilities that can be explored? Oh wow, that’s difficult to answer. I don’t know if there is a limit in exploring these stones. I think our limited knowledge is the one that would limit the possibilities. I have worked with the stones for three decades now, and what I have learned so far is probably not even half percent of what they actually offer. If I could just understand 1% of what they are before I die, that would be abundant, and I would be the happiest person in the world. That’s why I believe that these stones are the ultimate musical instruments. A few things; the frequency of the sound is different from any other conventional instruments. The highest frequency of conventional instrument is 4,800 Hertz, while Sanukit reaches 10,000 Hertz. The direction of the sound is also different; it is spherical. The angle of the cutting on the stone determines the direction of the sound. As for the overtone, Sanukit produces 3 times higher than the highest Western instrument can produce, and with duration over 2 minutes. Another thing is the “number of key”; Sanukit now has 100 keys while piano has 88. So it is one octave higher. All these, and there is still a lot more to come? Of course, and like I said, these findings are just a tiny fraction of what Sanukit can actually offer. I’m still so far away from the ideal, but at least I have learned more about the “DNA” of sound from these stones. Although I still have a lot more to go on, what I already gained is already plentiful to me. In the past thirty years your music has evolved with Zen Buddhism at the center. In fact, you have composed new “music” for ritual ceremonies at the Daitokuji Temple, and in the past five years your music has been embraced by the Temple and presented at the annual On Zen Ceremony there. Ritual “music” has not developed much in most traditions since they are considered sacred and “untouchable”. What made you take such direction? Since my return to Kyoto, my view on life has evolved. My understanding and appreciation toward the essentials in our life has grown. I said thank you at least twice a day; first in my morning prayer, and then at night just before I go to sleep. I truly feel grateful for everything that happens or is given to me everyday. We never know when we will die; we could die in our sleep. I just need to say thanks for the moment, minute, and day that I have before I die. This is to me one of the essentials that I mentioned, and Zen Buddhism is all about the essence of life. You were, and to most people still are not known as an “activist” who belongs to any organization; but over the past ten years you have chaired the advisory board of Sacred Bridge Foundation, a not-for-profit organization that focuses its work on cultural cultivation. Why? First of all is just fate. Secondly, we just have the same nature that covers vision, concerns and mission. My initial involvement was at the Sacred Rhythm Festival at the turning of millennium in Bali. At the time I just entered a new period in my life, and I felt that the new me simply matched what the organization was trying to accomplish. I’m very glad that I’ve been a part of it. Well Stomu, thank you very much for granting this interview, and also for the time you gave, but most of all we would like to thank you for your great contribution to music and humanity. It’s been a privilege indeed for us. Thank you for your kind words, and I can assure you that the grateful feeling is mutual. He is just unbelievable, I can’t even know how to describe. He has spiritual “Gate” to the sound’s of nature, and even creating a tools to made a connection in between. Which is mean these kind of stages seems impossible to reach for ordinary human. I wish that one day I could seeing his performance with his Magic Stone! Amazing! The stones sound so peaceful. Is there any information about an album or such? Probably none, huh? From another fan of Tchaikovsky’s ballet. I am speechless… i never imagine that a stone could produces that kind of sound. Honestly, when Sacred Bridge told me about Mr Yamash’ta using stone as music instruments i imagine it will like the prehistoric man pounding a pair of stone, but…this is a whole new level of exploration and development man… And The Sanukit instruments image above is really weird, it’s like a magical stone from another planet. Salute to Mr. Maeda, Mr Yamash’ta and Team! I am writing a book on Nic Roeg’s The Man Who Fell to Earth and I would be delighted to speak to Mr Yamashta about his memories of the inclusion of his music in the soundtrack. Would it be possible to forward my contact details to Mr Yamashta ? Thank you for your comment. Apologies for taking a while to reply. We’ve been heavily caught up with redesigning our website. We’ve sent you an email regarding your inquiry. Thank you.